Our product range includes a wide range of motorized trolley. Fostered with the short time experience, we are engrossed in presenting Motorized Trolley. This trolley is operated using magnetic and electrical source. The offered trolley is manufactured using quality materials and approved components. 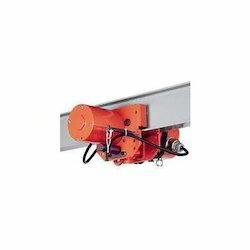 In accordance to industry standards, this trolley is developed and used in hanging cranes to pick and drop various containers, concrete materials and furnace vessels in steel plants. Furthermore, advanced technology and progressive techniques have been used for developing a robust and stable trolley for various industrial sectors.